This is the reference implementation of cooperative cut. A tech report and extensions to the model are coming soon! Cooperative cut is an inference method for Markov Random Field (MRF) problems that solves a class of higher-order energy functions by fast submodular optimization that encourages homogenous label transitions. 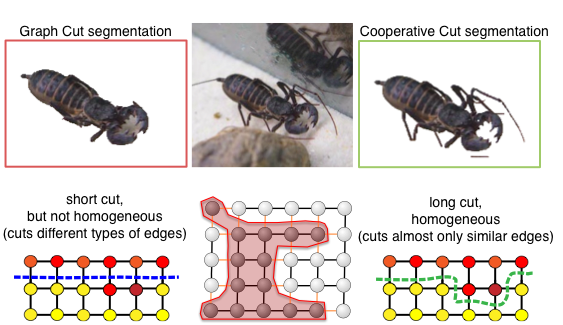 For image segmentation, this means cooperative cut encourages coherent boundaries. In practice this can help with difficulties due to shading or fine structures. How could we then identify a correct boundary? In many cases, the true boundary might have complex shape, but it is fairly uniform (congruous): the inside (object) colors as well as the background pattern do not change all that much. 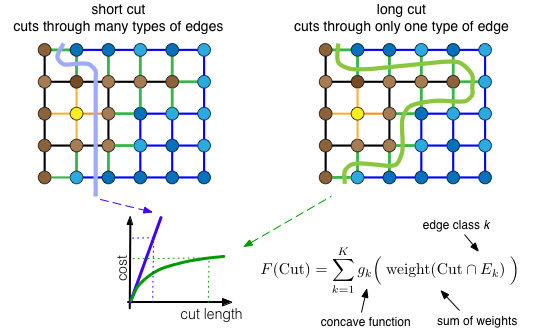 Therefore, cooperative cut models penalize boundary length only if the boundary is diverse, i.e., non-uniform. How is this achieved? We group the edges in the grid graph into classes of similar edges (similarity is determined from the color, intensity or other features of the adjacent nodes). We then have a submodular function over the edges that gives a discount if we use lots of edges from the same class - the cost increase diminishes as we cut more and more edges from the same class. But for each new class of edges that occurs in the cut, we must pay. Therefore, the cost of the blue cut below increases linearly with its length, and the cost of the green cut gets discounts. As a result, this function favors the continuation of similar boundaries over short-cuts, and helps to better segment fine structures. The inference can be done by an iterative graph cut method, as described in the paper. Stefanie Jegelka, UC Berkeley CS / ICSI. Trevor Darrell, UC Berkeley CS / ICSI.